A beautiful melon from Larry's Veggies! Pickled watermelon rinds are said to be southern, which is funny because all the people I know who eat them are from the North. If you were to be given a slice of watermelon (having never seen one), and were told it was edible, I am sure you would start with the ripe, red flesh. And then, as you neared the rind, your taste buds would tell you, "Stop! That's bitter!" This makes me wonder, who the heck thought of making something with the rind? My assumption is that these pickles were born of the "waste not, want not" frame of mind. Use every possible part of the vegetable or animal. I, myself, subscribe to this, and save chicken carcasses, beef bones, vegetable scraps, and shrimp shells to make a variety of stocks. Not only does it reduce waste, I end up with stocks that are much more flavorful than ones that come in cans. 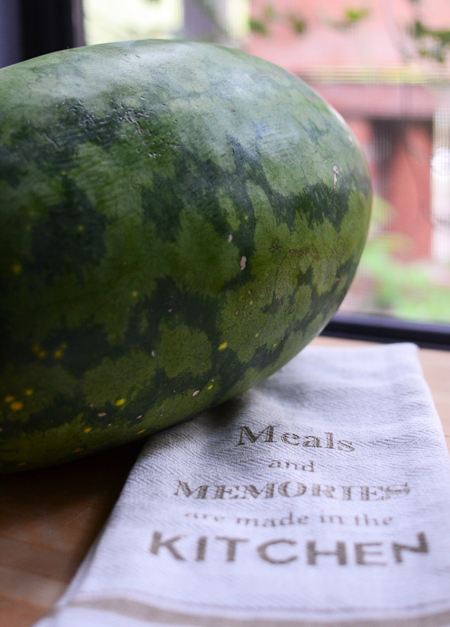 Although I was unable to find any specific information as to when and where they were first made, I did find references to pickled melons as far back as 1832, when the Massachusetts author and abolitionist Lydia Maria Child – probably better known for writing the Thanksgiving poem "Over the River and Through the Wood" – wrote of them in her book, The American Frugal Housewife (My thanks to Markipedia for this reference!). Supporting the "waste not, want not" mentality, the subtitle for this book is, "Dedicated to those who are not ashamed of Economy." She called them mangoes, but she was talking about pickled cantaloupe flesh, and not the rind. In an 1887 issue of The Atlanta Constitution, a recipe for pickled rind was published. 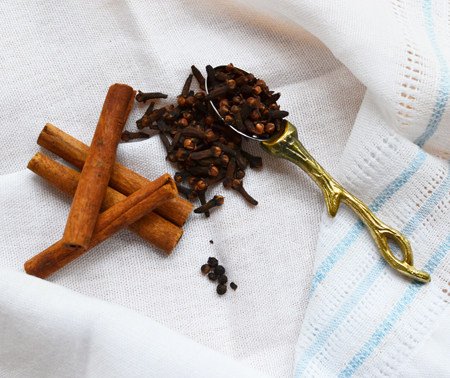 It called for cinnamon, cloves, and cassia buds (something similar to cinnamon in flavor). The recipe is not too dissimilar to the one I use today. Whoever figured this out - southerner or northerner - I am grateful to them, for these pickles were a very special treat in our household when I was growing up, always making an appearance in the relish tray on special holidays. We used to buy them every year from the Vermont Country Store, when we were there on summer vacation in the town where my mother was raised. My parents would stock up for each coming year. They came in a tall, narrow jar - the kind that required a skinny pickle fork to retrieve its contents. Unlike other pickles, the rinds take on a translucent, rather jewel-like appearance after being boiled for several hours. We served them as a sweet and spicy contrast to a roast - beef, pork, or chicken - and just the taste of them makes me think of Christmas, which (for those of you who worry about shopping time) is coming very soon. This past weekend I saw my first Christmas decorations exhibited for sale. The recipe I share with you today is a traditional family recipe from my friend Patricia, who got it from her grandmother, Claire. The process is actually quite simple, but I must warn you that it takes a lot of time... a minimum of 36 hours, during most of which the pickle maker is able to sleep, work, eat, read, or watch movies. If you like unusual pickles or preserves, I highly recommend these. They make wonderful holiday gifts, if you can bear to give any away. Thanks, Patricia, for sharing this family jewel! 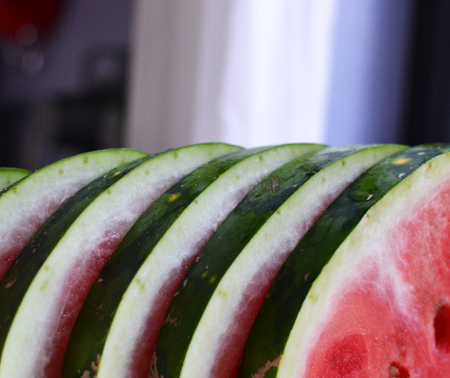 Halve the watermelon lengthwise and cut into 1-inch slices. Using a sharp knife, remove the thin, dark green skin, and then remove the red flesh as close as possible to the pale, white-green rind. Save the red-pink flesh for another use. 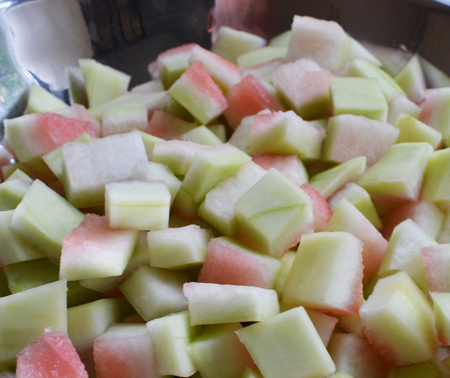 Cut the pared rind into bite-sized chunks, and place in a large bowl. Sprinkle the rind with the salt; cover with cold water. Place a plate on top of the rinds to keep them submerged. Let this mixture sit 8 hours, or overnight. After soaking in salt water, drain the rind and place in a large soup kettle; cover with fresh water. Bring to a boil, reduce heat, and boil for 1 1/2 hours. Drain. While the rinds are boiling, put the sugar and vinegar in another large kettle and bring to a boil for 30 minutes. Add drained rind. 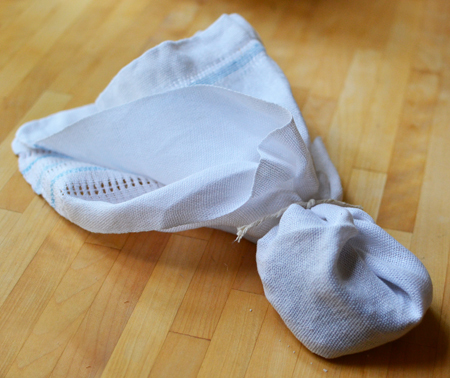 Place spices (cinnamon, cloves, and peppercorns) in a piece of cheesecloth and tie into a bag using trussing string. Add spice bag and drained cherries to the rind and syrup and boil for 40 minutes. Remove from the heat and cover; let sit for 8 hours. After the resting period, remove the spice bag and bring to a boil, and boil for 20 minutes. 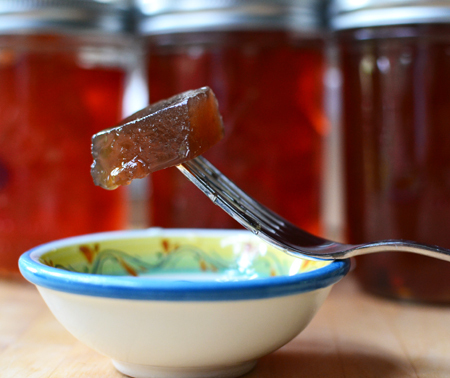 Using a slotted spoon, remove rind from the syrup and pack tightly into hot, sterile one-pint canning jars. Fill with syrup. Screw on the covers, and process is a boiling water bath (fully submerged) for 10 minutes. Delicious!! My "Granny Eller" used to make them and when ever we visited her we got to bring home jars of home made jellies, spiced crab apples and my favorite watermelon rinds. Thanks for the memories and the recipes. I had no idea you liked these, Jill! Since I have never found them to buy here, just had to make my own! Love them!! I see them sometimes in the "gourmet section" at Safeway around Thanksgiving - not nearly as good as my Granny Eller's or yours for sure :). Very pretty. If only my camera skills were good enough to capture the true jewel-like quality! Thanks, Greg! I must admit, Cory, I know like the rinds better than the flesh! You always post the most unique recipes! Growing up in the South I'm surprised I've never even heard of these. They certainly sound interesting, and they look beautiful! I bet they're good with the cinnamon and cloves, but I'm having a hard time imagining it with the vinegar and everything. Does it taste at all like watermelon or is the rind mostly just a vehicle for absorbing the other flavors? My brother-in-law always tells this story about the whole "waste not, want not" philosophy where an older family member of his talks about having butchered pigs growing up, and says that they "ate everything but the squeal." Thanks, Caroline! I was honestly surprised to find out these pickles are Southern - maybe they were, and just went north, If anyone else out there has had experience with them as a Southern food, I would love to hear about it. The pickled rinds don't taste at all like watermelon - they really become an innocuous vehicle for the sweet and sour flavors. If you were worried about the vinegar, not the amount of sugar with it - 6 pounds will counteract that! Think of it more like a chutney, but with big chunks, or like its Italian cousin, mostarda. Markipedia worked at a living history museum where they butchered pigs and he, too, said they use everything but the "squeal," However, one clever person dried the tail )(they are hollow) and made it into a whistle, thus "using the squeal," as well. Wow! I had no idea pigs' tails were hollow or that you could make them into a whistle. I'll have to share that with my brother-in-law. And yikes! That is a lot of sugar! Sugar is a major food group, right? This recipe is totally new to me and it sounds delightful. I had no idea it was possible to pickle watermelon rind and the combination of flavors used in the process makes me want to try it ASAP. David, the pictures are beautiful! Thanks, Daniela - it is really hard to capture the jewel-like quality of these. I think you will love these pickles; they go well with so many foods! Amazing, David! My ex husband would have loved this... he enjoyed anything pickled.... whereas Peter won't touch them. Love this post! That is funny, Liz. 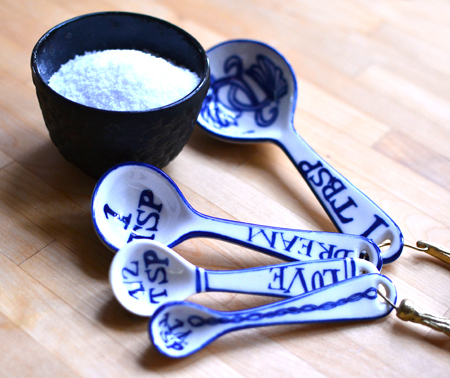 I have a friend who won't eat anything made with vinegar... so these are out for her, too. Such a lost - they are really quite tasty! Hey David! 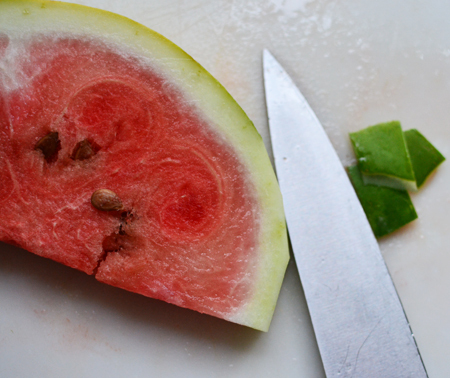 I just bought a thing called The Perfect Pickler and have been planning to do watermelon rind. I know my grandma made them and I have been trying to locate a receipe. I'll have to see if yours can be adapted to The Perfect Pickler, which ferments in 4 days on the countertop. I have made garlic dill pickles, tarragon pickled asparagus and a nice anise flavored Asian Slaw. Do you know this gizmo? It is stupid easy! Cathy - you might give it a try. I think the main thing to check is to see if your gizmo works with a heavy sugar syrup. The pickled asparagus sounds particularly amazing! They look wonderful though, I love the colour! They really are beautiful. I need to come up with some new ways of using them. You should definitely make them - they would be good with Indian food, too! 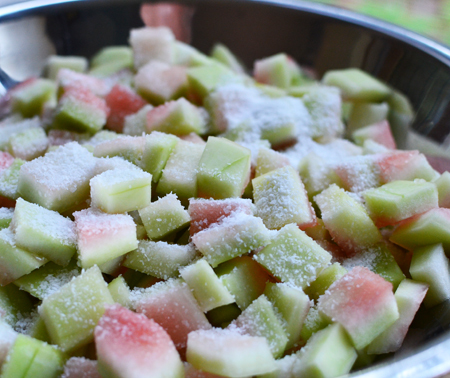 Thanks to you, I am a fan of pickled watermelon rinds. You gave me my first jar of rinds from The Vermont Country Store! The recipe sounds easy enough and there are many people on my gift list who would enjoy receiving a jar! You should definitely make these, Susan! I didn't mention in the post that we have away all the flesh! Mark doesn't like it, and it was too much for me! I had a couple pieces and then friends from work enjoyed the rest! Dear David, never tasted watermelon rind but I have seen many a recipe for them - the most recent one being in Bon Appétit - I asked my friends and they have never eaten them either but it does look like a rather intriguing recipe to try. Oh, Andrea! I would love to go to that farmers market! I feel so lucky that ours is every Sunday! I hope you try the pickles - they are really a fun way to avoid waste of the rind! this sounds so interesting! never seen or tasted anything like it - am tempted to try when the season starts here in Australia. Hello, Paola! Yes, I think the rind is pretty much the same, but (at our farmers market) only the heirloom varieties with pips/seeds can be found. Is there a difference in the flavor? We loved spitting the seeds when I was a kid, making games to see who could get theirs the furthest! I tasted pickled watermelon rind when I was a child and remember that I wasn't too keen on it. That being said, I certainly do not remember them being a pretty as what you show here! My household is a huge consumer of watermelon (the seeded variety, seedless is just to tissuey / peculiar texture) and now I may have to make some pickled watermelon as you suggest! Maybe it is time for another try, Cali! You just answered a question for me - the seedless varieties are tougher! I had no idea, as I usually get the heirloom variety with seeds. If you make the pickles and still don't like them they make wonderful gifts! I have never had pickled watermelon rind. I see jars of it at the supermarket, but it doesn't look very nice. Yours looks so appetizing. I'd probably eat myself into a tummy ache! Gotta get a melon and make it before summer's over! Thanks, Cheri! Things are finally cooling off in the desert in preparation for your return! I've heard of pickled watermelon rind, but I've actually never seen it! Yours looks yummy and now I'm very interested to give it a try sometime. You post some cool and unique recipes! Thanks, Marcelle - I am glad you enjoy the unique recipes - I always worry they will scare people off! I've known about them for quite some time but never actually tried any. Something tells me I'd really enjoy eating them! I think you would love the acidity and spiciness of them, John! I still want to know who came up with this idea, Laura. It seems unthinkable, until you try them! 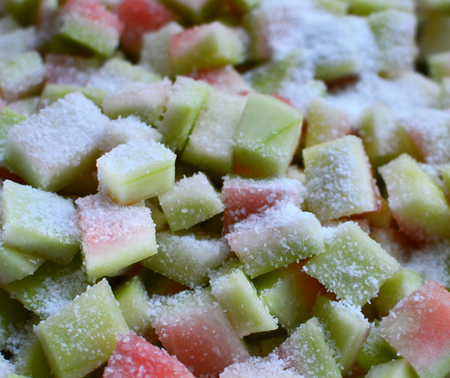 Finally i have seen a wonderful recipe with my favorite Watermelon fruit. 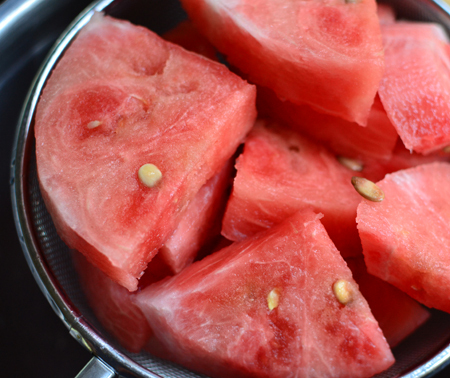 I love to eat watermelon specially when i am on the beach in summer. By the way your Family Jewels recipes was just awesome. I think it will be to much delicious so that i can love this much more than any other recipes, I have to try this recipe much. After a successful mission i will publish in our Food Network . Thank for helping us by this kinds of recipes. Thanks, Jennifer! I hope you do enjoy it, and let me know if you post on your Food Network! I would be honored, and so would my friend Patricia! Have a great day! Thanks Cocoa and Lavender . You are great . Huge respect from me. Yum! Love the look of the translucent rind - never would have guessed that was what it was, if not told. I never have had pickled watermelon rind; never even heard of it before, until our Wok Wednesdays group stir-fried watermelon rind (and it was good!) and doing a Google search at that time. The Chinese are very frugal, and big on the "waste not, want not" mindset. I remember when you did the stir fry with the rind! It made me remember these pickles. And, I really agree with you - the Chinese do not waste anything! Wow! That is amazing! I can't wait to try that recipe for the preserves. It is very different but it sounds like it would be so good. Thank you - that kind of recipe is probably the historical antecedent to the one I used. You will love them, Valentina! I am trying to think of different ways to use them! 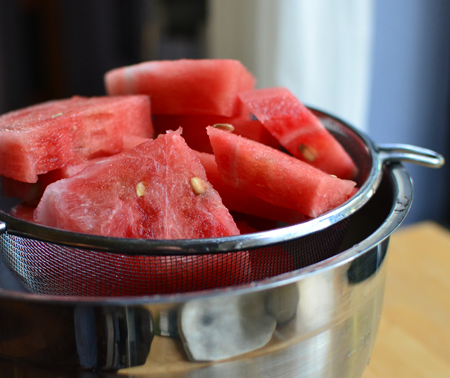 I came across pickled watermelon rind recipes this summer while looking into how to preserve an excess of watermelon. Alas, I realized that deciding to use the rind too (while buried) would only exacerbate my problem. But I did take note of the concept--for consideration in a saner year. This has given me even more motivation! That is often how I feel when presented with a watermelon, Inger... do I actually have time for this? The good news is that the active time is minimal, so it can be done! What a fantastic recipe! I've only recently tried pickled watermelon rind and I've become obsessed as a result. Now I can finally make it myself! Dear Queen - I am so glad you found this recipe! Hope you spread all this goodness all over Australia! I had to pin this, I have been thinking of making these for ages... although now I fear I will have to wait another year! 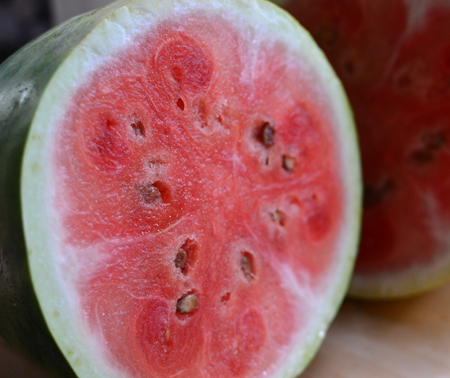 Fiaona - the first year I got the recipe, I waited too late and there were no watermelons to be had! It was worth waiting for, though!